Home Moto Laia Sanz recognizes it: "Toby Price is a beast"
Laia Sanz recognizes it: "Toby Price is a beast"
The Catalan KTM is already eleventh in the general classification: "I would have signed the top-15 before starting". 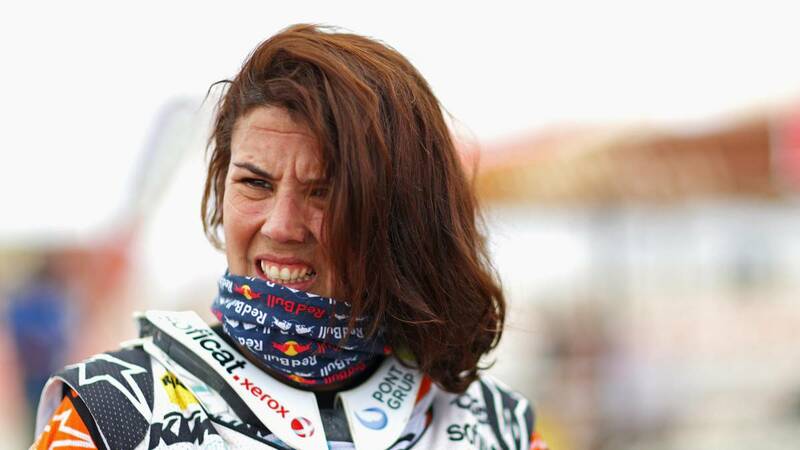 Laia Sanz is already eleventh in the overall classification of the Dakar after the penalty to Kevin Benavides and the Van Beveren engine break. It is his second best result in this race after the ninth overall position achieved in 2015. -The top ten are far away but it does not matter, I would have signed a top-15 to spare before starting. It depends on the year, if more or less things happen you have options to move forward. For me, I did better in 2018 and finished 12th. Although with this pace I have not messed up any day, which is also important. -Well, there is still the stage of morning. But Toby is a beast, the pain that has to be holding no one would hold it. He has a very strong head. -The two! I do not know if it's canceled, but you have to cut your hair. -Today I found myself better, besides there was more sand and less fesh-fesh, it's the first day of the Dakar in which I really enjoy it and with good rhythm. I had a problem with the back pump that made me lose time, but at least I had fun. -The last special has 112 kilometers. What differences can there be? -It can be complicated, today navigation was not easy with difficult waypoints to find. It depends on what you want to do with the waypoints.